The internet of things is, as the name implies, a merging of bits and physical objects. Those objects represent a ripe destination for new types of silicon chips, prompting a wave of mergers and acquisitions (M&A) in the semiconductor market. The most recent news is the acquisition of NXP by Qualcomm for a staggering $47 billion. The combined company will be one of the world’s largest suppliers of semiconductors in general, with revenues comparable to those of Samsung and Intel. Across each of these deals, IoT has played a role. Let’s dig in to the acquisition rational showcased by each of the acquirers. 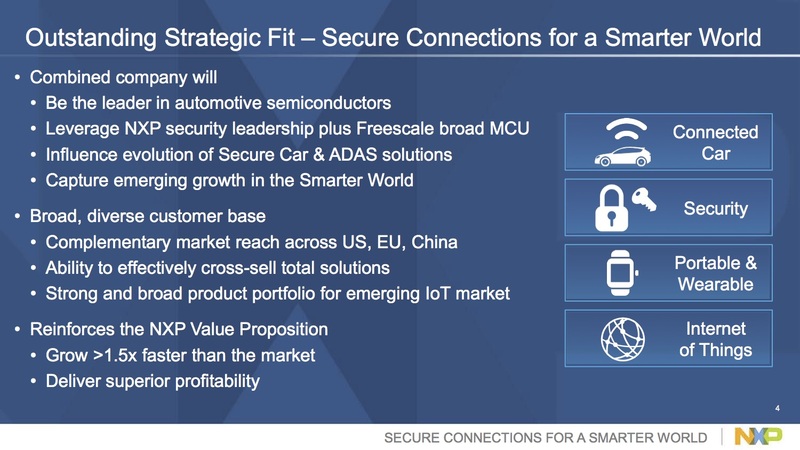 The NXP acquisition of Freescale in 2015 kicked off the large dollar M&A activity under the banner of “Secure Connections for A Smarter World.” As noted in the NXP investor presentation, IoT played a significant factor. A broad definition of IoT that included connected cars, portable and wearable devices, and security would say IoT was the driving factor entirely. The second largest of the five deals mentioned in this blog post, Avago and Broadcom, was the least directly referenced to IoT. Broadly the acquisition news noted the strong wireless network position held by Broadcom. 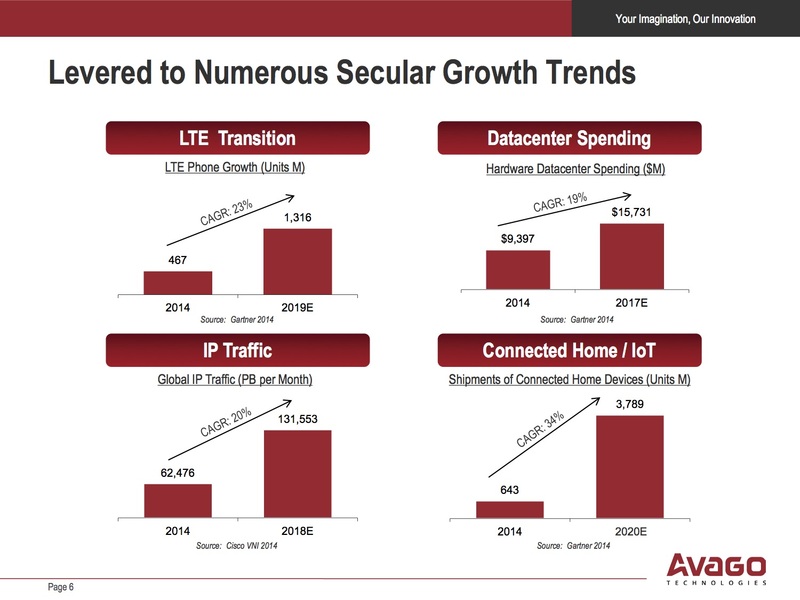 That did not stop Avago from citing connected home devices and IoT as a contributing growth trend. 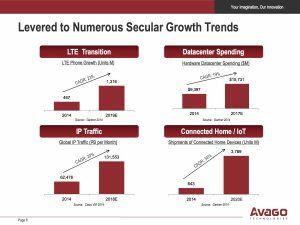 Avago Technologies’ Feb. 2, 2016 acquisition of Broadcom for $37 billion focused on leveraging Broadcom’s leading Wi-Fi technology for the IoT market. 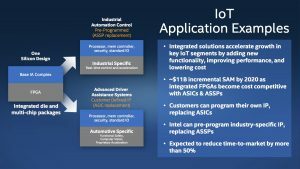 When Intel announced it was acquiring field-programmable gate array leader Altera, it made the fit with IoT explicit through two application examples. 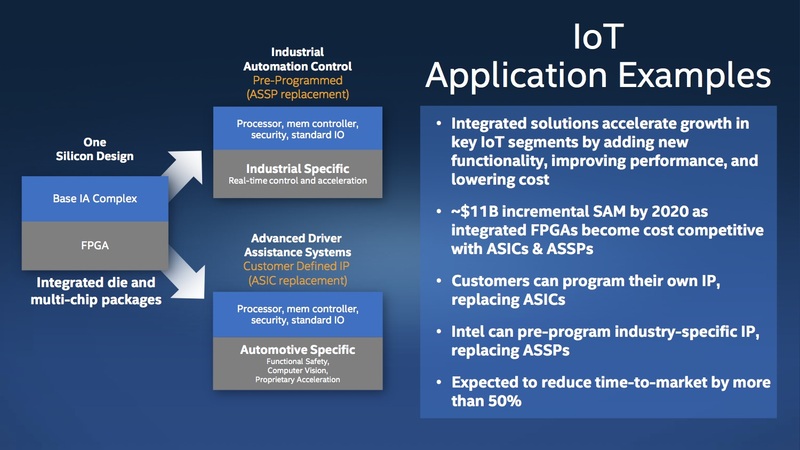 Across both industrial automation control and advanced driver assistance systems, Intel showed how the base Intel Architecture Complex (processor, memory controller, security and input/output) could be tightly coupled as integrated solutions with Altera products. We have long admired ARM as a world renowned and highly respected technology company that is by some distance the market-leader in its field. ARM will be an excellent strategic fit within the SoftBank group as we invest to capture the very significant opportunities provided by the internet of things. That thinking continued in the investor presentation: The Next Paradigm Shift is from mobile to IoT and ARM is a key driver of the IoT Era. 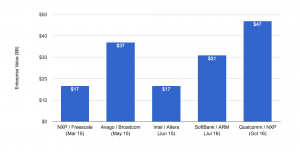 The Qualcomm deal with NXP is the latest example of chip companies acquiring capabilities within growth markets, particularly automotive and internet of things, as traditional semiconductor PC and smartphone markets mature. 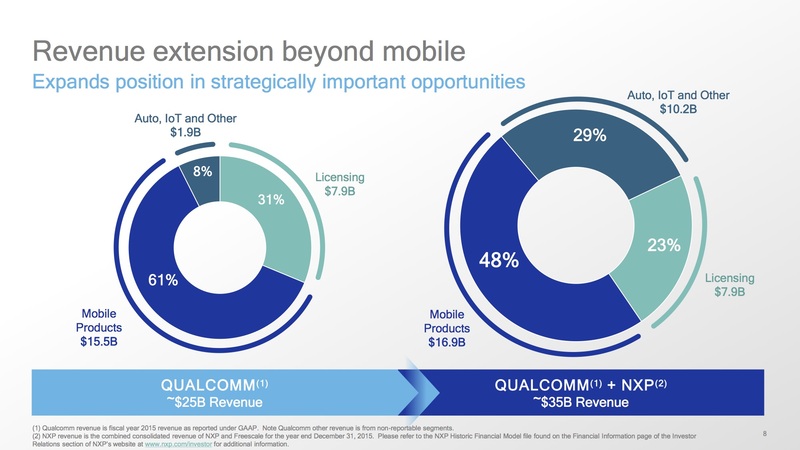 Qualcomm expects the acquisition will increase its addressable market by 40%, driven by increasing semiconductor content per car in automotive markets, exponential growth of connected devices in IoT markets and growing adoption of credit card security technologies. Qualcomm made the growth plans concrete by showcasing Qualcomm revenues for “Auto, IoT and Other” growing from $1.9 billion before NXP, to $10.2 billion after the acquisition. While the technology industry continues to go crazy over the internet of things and all of its potential, the semiconductor sector is racing ahead to deliver the chips needed to make it happen. No doubt the market is putting a high value on this activity. 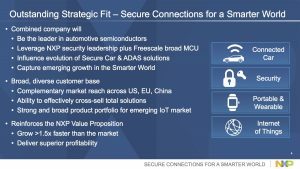 We have taken a closer look at IoT platforms (see Major league IoT platforms: Eight giants to watch) and connected cars (see The four horsemen of connected cars), but neither of these areas have generated the merger and acquisition activity of the semiconductor sector. Perhaps we will continue to see semiconductors retain the stage for M&A, or perhaps 2017 will bring a shift to other areas of IoT.